Jimmy can’t stop the words. He can’t make them behave. Jimmy wants to be an astronaut when he grows up. 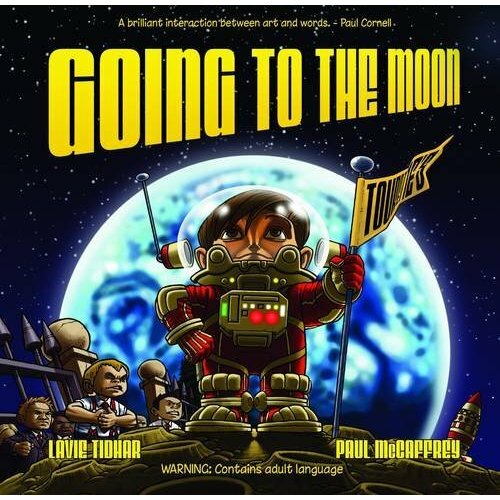 Going to the Moon is the the funny, profane, and ultimately heart-breaking story of a boy with Tourette’s Syndrome who wants to become an astronaut when he grows up. It is a story about bullying, about friendship, and ultimately about dreams. A picture book with brilliant art by Paul McCaffery, telling the story of Jimmy, a boy with Tourette’s Syndrome who is bullied at school. Published February 2012.